“But I think we have the team in place that is up to the task,” Mecca said of Klai Juba Architects, Dougall Design, and M.J. Dean Construction Inc.
Starwood Hotels and Resorts Worldwide have been managing the property since Robert Earl took over the property. With the Aladdin Las Vegas in the high 90 percent range of occupancy it had the highest daily room rate of any Las Vegas Strip hotel last year. New Planet Hollywood Las Vegas logo signage that identifies the brand’s Planet Hollywood hotel is already in felt on the gaming tables. The Desert Passage mall, a collection of 140 stores, will also shed its Arabian theme. The Strip entrances will also be changing to match the Planet Hollywood standard. Call 702-505-6988 for VIP Las Vegas commercial real estate representation by a Las Vegas real estate agent. Selling, buying or refinancing a piece of Las Vegas Real Estate today? Visit Fine Homes Real Estate for more information and VIP representation by a Las Vegas Luxury Real Estate REALTOR for investment Las Vegas Real Estate, 1031 exchange, condos such as Trump Towers Las Vegas, Turnberry, Allure, Panorama Tower, The Signature MGM Residences, W Residences, RED Rock real estate, commercial, residential and Las Vegas land. 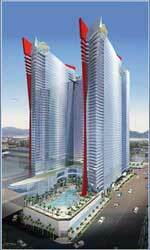 Westgate Resorts Las Vegas condos at Planet Hollywood Las Vegas Hotel.